On a Saturday afternoon in March, I went to The Bike to meet up with my friend Chris who works there as a mechanic. After the shop closed, we headed to the Lausanne station with our bikes to catch a TGV to Dole in the French Jura. 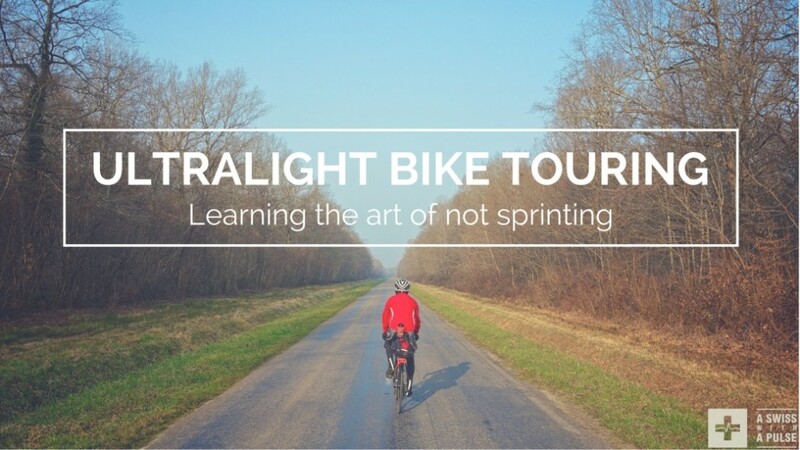 Our plan was to recce part of the planned route of The Transcontinental Race. What is the TCR? A bike race that starts on July 24 at midnight at the iconic Muur van Geraardsbergen in Flanders. The finish? Istanbul, Turkey. There are no stages. There is no official course. Just four checkpoints that we must cross on our adventure across Europe. Support is forbidden. One goal (at least for me): make it to Istanbul in time to be at the finishers party and drink beer with the other survivors. Somehow, I decided that it would be a cool 2015 challenge. There will be a lot more about the TCR on this blog in the coming weeks and months, so stay tuned. We spent the night in a motel, had breakfast in our room the next morning and headed out at 7.45am. 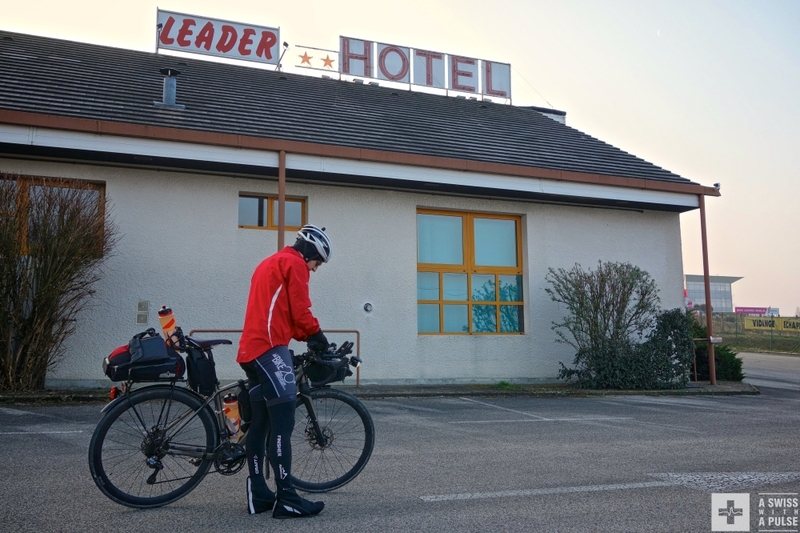 It was bloody cold, but I was excited: it was my first multi day, self-supported bike tour ever. 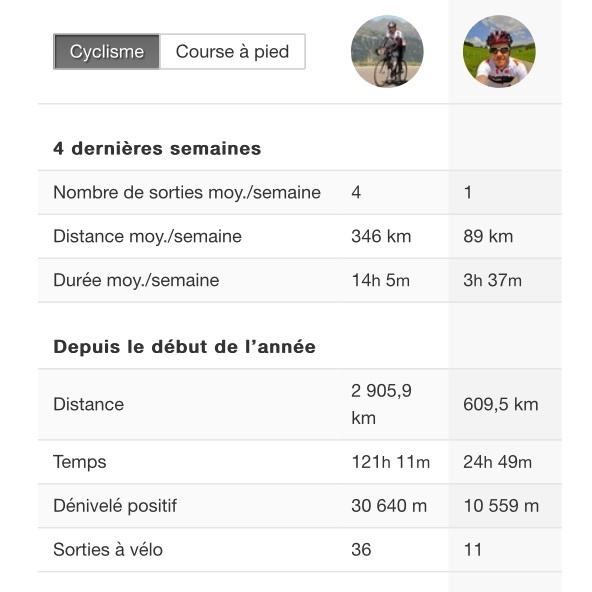 I was also a little scared by Chris’ training stats compared to mine. OK, I had spent most of the winter cross country skiing and ski touring at home in the Swiss Alps. But still. I would soon discover if cross training really worked. Off we went in the cold and quiet countryside. 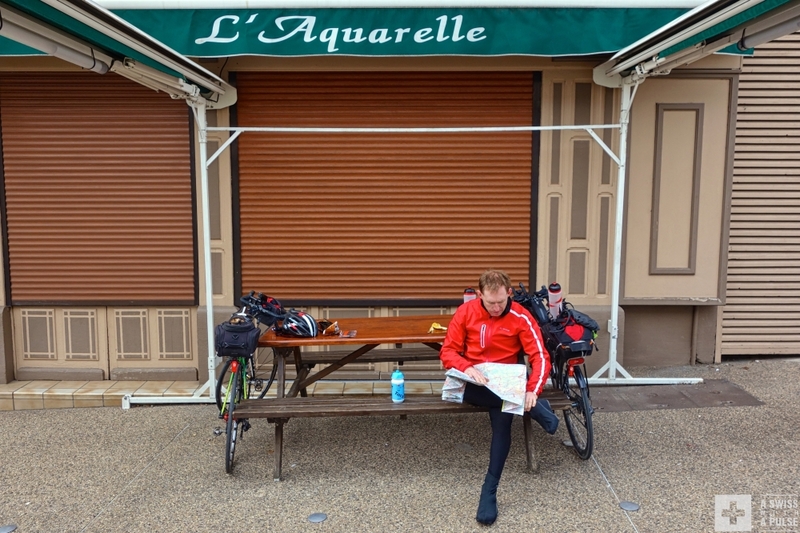 At one point, the temperature got down to -1°C and I was freezing at our first stop in Louhans after 75km. We bought lunch and energy food for the rest of the day, and I had some bad French coffee to warm up. The good news was that the cold wind was a tailwind and there were no big climbs, so we were making good progress. We had lunch on the roadside around km 110. 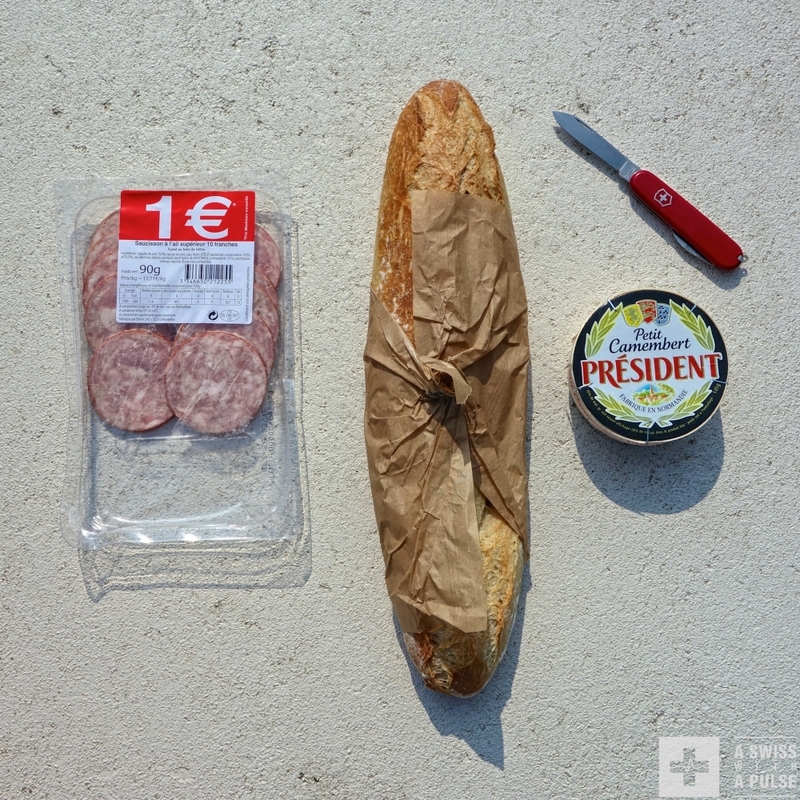 Bread, camembert and €1 garlic sausage. Only red wine would have made this more French, but we abstained. Keyword: consistency. Don’t stop too often. Don’t push too hard, just keep moving. 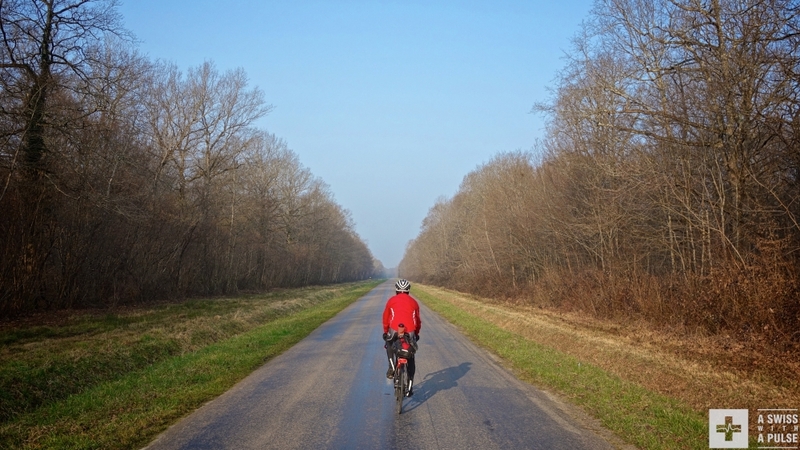 The rule of thumb: try to maintain an average speed of 25km/h when on the bike, and stay above 20km/h stops included. You are only allowed to sprint when chased by dogs, which happened once on that day (I have no photographic evidence as I was too obsessed with staying on Chris’ wheel when it happened). You should also slightly accelerate when a truck is overtaking you to benefit from the draft a little bit longer. Chris did the TCR race last year and is coming back this year with a lot of experience. He has a Facebook TCR page and a website. As a bike mechanic, he is obsessed with details and could teach a lesson or two to Team Sky in terms of marginal gains. Indeed, it takes a lot of energy to beat the air resistance at this speed, and energy is the only currency in endurance bike riding. Save it for later, when it really matters. As a result, his big ring is a 44, which allows him to stay on it much of the time and be more efficient. Marginal gains… Chris also has a PhD in cognitive psychology, but he prefers to work in a bike shop because this is what he loves. He is a great friend, and I feel very lucky to have him as my TCR guru. We made it to Vienne, south of Lyon at 6.15pm after 227 km. I was tired, but happy. I had made it through day 1. We looked for a hotel, chose the local Ibis Budget, checked in, had a shower, then started hunting for a restaurant. La Taverne de Maître Kanter was seemingly the only place open in town on a Sunday night and it was just what we needed. We had a big dinner topped up by profiteroles, the most calorific food on earth, and good beer. Chris made a cool video with his action cam. This was our day: quiet roads in the countryside, villages, speed bumps, roundabouts. The next day would be more of the same, with some variations.